An inside look at Switzerland’s iconic race and the mountain-running professor who founded the race. 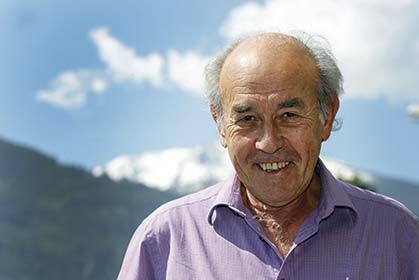 Jean-Claude Pont, 72, Professor Emeritus of History and Philosophy, part-time astronomer and certified Swiss mountain guide is holding court, recounting the origins of the iconic 31-kilometer Sierre-Zinal race. Retired from guiding and teaching, Pont’s body shows equal parts of both. Receding gray hair, unkempt around the edges, would allow him to march unaccosted into any university building anywhere. Reading glasses come out often these days, positioned halfway down his nose. The professorial downward head tilt and quick glance over the top of the frames comes so naturally to Pont, I find myself alternately seeking approval for a good observation, and fearing a dismissive rebuke. Though he’s added a few pounds to his 5′ 9″ frame over the years, there is an ingrained sturdiness that suggests he could still out-hike most local teenagers to Cabane de Tracuit, 5,200 feet above his chalet. Stiff on standing, he might be a slow starter, though. There’s a big jar of ibuprofen around here somewhere, I think. Pont, who is sometimes referred to by his initials, J.C., is in the cozy living room of the small, low-ceilinged chalet that he and his family have called home for three decades. Knotty pine walls are simply decorated with colorful mountain illustrations sketched by a family friend. An inviting sofa expands out from a corner in both directions, and a patterned rug splashes vibrant colors into what would otherwise be a cloistered space. The chalet is unpretentious, and both host and home are inviting. Above us are vertiginous pastures that form the steep east and west valley walls above the Swiss village of Zinal, located in the French-speaking state of Valais, not far from the country’s borders with Italy and France. The topic at hand is a moment 41 years ago, when Pont first conceived of a mountain race that would start in the city of Sierre, in the Rhône valley, 31 kilometers away, and finish right here, in the middle of the village. The course would climb over 7,000 feet, following a mountain ridge for much of its distance, and finish with a near free-fall into Zinal. 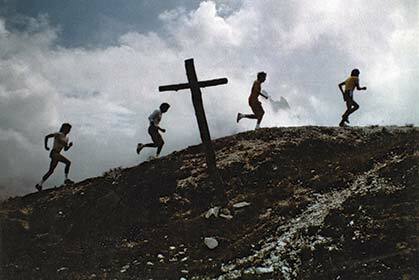 At the time, there were few if any trail races in Europe. Running from Sierre to Zinal was a revolutionary idea. “Now, they’ve all run it. They see that it works.” A quick smile crosses his face, and the wrinkles of consternation in his forehead are gone. A matter-of-factness in Pont’s voice hints at the vindication. In fact, Jean-Claude Pont’s race more than “worked.” Sierre-Zinal, the event he has shepherded for more than four decades, has taken its rightful place among the world’s most loved trail-running events, alongside internationally known classics like Western States, Pikes Peak and the Ultra-Trail du Mont-Blanc. 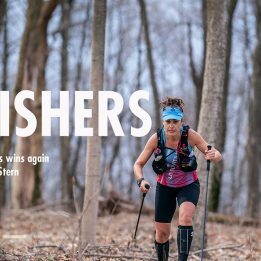 “I had heard legends of top U.S. athletes going over to compete in Sierre-Zinal,” says U.S. Mountain Runner and Salomon team member Kasie Enman. “Later, I got to experience it. Sierre-Zinal brings out top athletes to compete in one of the most beautiful landscapes in the world.” Enman would take sixth place in last year’s race. But Sierre-Zinal is more than just another competition. The event has become a homecoming for much of the world’s mountain-running community. It is suffused with a lively, supportive spirit that makes it one of the most exalted trail races anywhere. And behind it all was one person. Understand Jean-Claude, and you understand the philosophy that underpins one of trail running’s marquee events for the last 40 years. University professor and Swiss mountain guide Jean-Claude Pont. This year, after 43 years as race director of one of the world’s most iconic mountain races, he’s stepping down. Photo by Gerard Berthoud. One day in Zinal, the young Pont found a book on astronomy, which immediately captivated him. He quickly understood that if he wanted to fully understand astronomy, he would first have to learn physics, math and chemistry. A chemistry set arrived on Christmas morning. Pont was a quick learner, making, among other things, nitroglycerin. His bedroom walls in the chalet soon bore the scars of his experiments; Jean-Claude, it seems, had forgiving parents. Within a few years, Pont’s twin interests had taken hold. 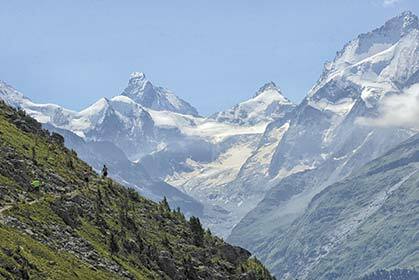 Summers were spent guiding clients up the Weisshorn, Matterhorn and other nearby glacier-covered peaks. Then, every September, when Zinal’s flocks of sheep and herds of cows were moved lower in the valley, Pont wasn’t far behind—first as a student at ETH, the prestigious Swiss Federal Institute of Technology in Zurich, then as a teacher in the valley town of Sion and, finally, as a university professor in Geneva. Then, one day, he had an idea. Midway through the course and moments before an aid station at the Hotel Weisshorn, Sierre-Zinal participants roll past bucolic farms, with the Valais Alps in the distance. Photo by Nicholas Ferrier. The 32-year-old mountain guide and teacher had good reason. To start, he wasn’t a mountain runner—or a runner at all, for that matter. And, in the autumn of 1973, Pont knew of nothing quite like what he had in mind, anywhere in Europe. There were races over the fells in England, and a team mountaineering race around the nearby Dents du Midi range that used climbing ropes and ice axes on technical terrain, but that was it. He was vaguely aware of the race up Pikes Peak in the United States. The same curious mind that turned his childhood bedroom into a minor war zone ultimately took over, and led him to create one of Europe’s preeminent mountain races. To start, Pont knew much of the route, from his days as a guide. To quickly regain fitness after a sedentary academic routine, he would load stones in his pack, and hike the steep 5,000-foot climb up from Sierre and through the forest, and finish at the alpine pasture of Ponchette. Second, as a guide and teacher, Pont was eager to share his discoveries. “A teacher can’t help but share,” he says, “and when you are a guide, you are roped together with all skill levels.” The climbing rope, representing a bond between generations, became a metaphor that guided Pont’s thinking about the race. Finally, Zinal was struggling. The town needed ideas for its new tourism industry, and Pont was on the town’s development committee—a position he went on to hold for 41 years. In Pont’s world of philosophy, an accident is anything that changes the course of one’s life. His race might just be the perfect example. There was more serendipity to come, too, for Pont lives in a valley with some of the greatest trail-running terrain, anywhere. 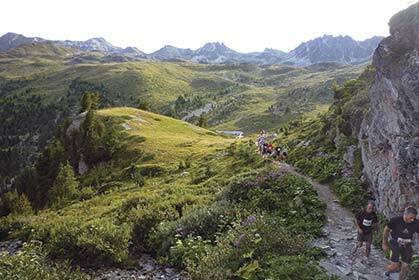 For a middle-distance race of 31 kilometers, Sierre-Zinal seems to have it all. There may be no better judge than Wyatt. He’s run hundreds of races around the world—including the three passes at Sierre-Zinal. And he holds the course record of 2:29:12, a time that’s stood for a dozen years. The course starts on the outskirts of Sierre, a centuries-old Swiss town on the banks of the Rhône River, and almost immediately wends through cliffbands and climbs on steep singletrack through deep forests. Some 4,000 feet of climbing later, it bursts out onto a grassy alpine pasture at Ponchette, a location with far-ranging views of the glacier-covered peaks that give the race its nickname, “The race of the five 4,000-meter peaks.” Runners often reach this point just as a red morning sun is cresting the Valais Alps. From Ponchette, participants race through pastures, along high-elevation dirt tracks and through a narrow chute of cheering residents in Chandolin, one of Europe’s highest villages. Now thoroughly above treeline, runners dodge cows, pass the 130-year-old Hotel Weisshorn, meander in and out of alpine ravines—and finish with a precipitous 1,300-foot dive through steep-angled forests and pastures into Zinal. That variety of terrain makes for an interesting race. “Due to the variations of the course, you see lots of lead changes with athletes taking advantage of their strengths at one point, and really exposing their weaknesses at others,” says U.S. Mountain Running Team member Joe Gray, 31, of Colorado Springs. 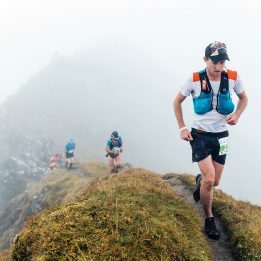 Gray finished second last year to the Basque mountain-running phenom Kilian Jornet. In the process, he set a new United States record. And then there are the rest of us. The first time I ran Sierre-Zinal, in 2011, the course ripped me to shreds, as my exuberance supplanted any strategy. By the time I hit Zinal, I was long out of fuel and ideas. Any emotional armor I had was left as litter, hours ago. I hit an endless line of spectators cheering, it seemed, for me alone. Tears welled up. Sierre-Zinal, with its striking views, is called “The race of the five 4,000-meter peaks.” Visible in the distance: Ober Gabelhorn, Matterhorn and Dent Blanche. Photo by Peter Hartley. On the first running of Sierre-Zinal, on August 11, 1974, there were few cheering spectators along Rue Les Liddes in Zinal. A month before race day, Jean-Claude had signed up only 70 runners. As the race drew near, though, numbers began to build. Pont and his team adjusted plans accordingly. A tarp in the forest for post-race festivities became a large tent. But, when the morning of the race arrived, there was a problem—a big one. Early snows 5,000 feet up in Chandolin threatened to cancel the event before the starting gun was fired. As Pont fretted and race organizers huddled, the number of entrants continued to climb. In the end, 1,000 runners showed, the snow moderated and Pont’s crazy idea was a go. Jean-Claude and his crew turned out to be savvy organizers. They had done their homework, spreading the word systematically and successfully recruiting a number of elite athletes, including a local Olympic Nordic skier, a number of noted British runners and Belgium’s Gaston Roelants, an Olympic gold-medal winner in the steeplechase at the 1964 Tokyo Olympics. “We knew,” says Pont, “there was a story there for the journalists.” Among the runners that morning was the race director himself. Pont would go on to run the course each year for the first 15 years, and 39 times in total. Through the last four decades, Sierre-Zinal has continued to grow and flourish. Few have seen those changes more closely than Trudi Rufer’s son Peter, who first ran the race in 1976 at age 10. He’s now closing in on his 15th running, which, these days, will have him chasing his kids toward Zinal. In those first years, Rufer recounts that runners would reach Zinal, and head straight for the local swimming pool, where many stripped down to mud and chafed skin for an aquatic cool-down lap. Gone, too, are some of the touches that today would seem downright anachronistic, like the posting of soldiers along the route, who would whistle to earlier-starting recreational runners that an elite racer was approaching. Even in that first year, Pont was busy implementing his philosophy. To start, race volunteers were given an exalted status that still stands—so much so, Pont even arranges for them to have their own private race. Come September, long after the main event has come and gone, volunteers gather for their own running of the course. This past year, 80 volunteers took part, and many return year after year. During Sierre-Zinal, it’s hard to look up from the trail without seeing a smiling face and a bright “Bénévole” T-shirt. For the tourist division, Pont added a unique twist. Rather than leave en masse with the elite runners and feel relegated to second-tier status, Pont had them start at 5 a.m., four and a half hours before the elite runners. As a result, many complete the race and have time to line up along the final few hundred yards and watch the likes of Kilian Jornet and fellow Skyrunning Champion Stevie Kremer, 31, of Crested Butte, Colorado, follow in their footsteps. A few are still on the course as the world’s best runners fly by them. If the philosophy of Sierre-Zinal isn’t clear to a participant by the time he finishes the race, it is before the day is over. Pont brings everyone together for a renowned post-race party. More than four decades in, Sierre-Zinal concludes under a massive tent, capable of holding thousands of participants, spectators and volunteers. Maybe it’s the endorphins, maybe it’s Pont’s conscientious efforts, but it works. That first year I ran, I recall the dull roar of a boisterous party, as I approached the tent. Before stepping over the threshold, I surveyed the scene: the familiar faces of elite athletes, tired-but-glowing recreational runners, eager volunteers—and long lines for more beer, wine and the local melted cheese with potatoes. The 2012 winner, French mountain runner Aline Camboulive. In the background lies the valley start in Sierre. Photo by Jose Luis Hourcade. As the years passed, while Jean-Claude continued to throw energy and enthusiasm into the race, he packed a lot into the rest of his life as well. Together with his wife Christine, they raised three children and now count themselves as grandparents to five. He wrote treatises on the history and philosophy of math and science, and continued his interest in astronomy, co-founding a much-loved observatory and a 3.7-mile-long Sentier des Planètes, or planet walk that lies, incidentally, along the route of Sierre-Zinal. It, too, has its philosophy, developed by Pont: “Where humanity meets the real stars.” In his free time, he wrote a book of word games. Along the way, Pont built a reputation as an original thinker—Sierre-Zinal being just one example. Peter Rufer’s father, Charles, describes Pond as, “Not afraid to swim against the mainstream. That takes courage and knowledge.” And swim against it, Pont does— sometimes, arguably, too far. In 2010, he lectured to 400 attendees against what he called “Les Réchauffards” or “The Rewarmers,” believing that scientists, institutions, the press and financial backers were creating a story of man-made climate change where none existed. Pont does not deny that the planet’s climate is changing, but remains skeptical of claims that it is all human-induced, citing, among other factors, the role of solar cycles, changing cosmic radiation levels, astronomical phenomena and the physics of carbon-dioxide release from a warming ocean. There was an unintended consequence to Pont’s efforts in Sierre-Zinal, as well—one that, for the trail-running community, just might be as important as the race itself. Each summer, Sierre-Zinal serves as a kind of informal and much-loved homecoming for elite runners from around the world. The climb above Sierre includes ancient singletrack that switchbacks through cliff bands (the yellow “Z” marks the course). Photo by Gerard Berthoud. Forty-three years after those first runners pushed off from Sierre in one of Europe’s earliest contemporary mountain races, the European trail-racing scene is varied and widespread. There are community races to mountain huts, an International Skyrunning Series and epic endurance tests like the 166-kilometer Ultra-Trail du Mont-Blanc. Sierre-Zinal endures, stronger than ever—thanks in large part to the philosophy that underpins it. 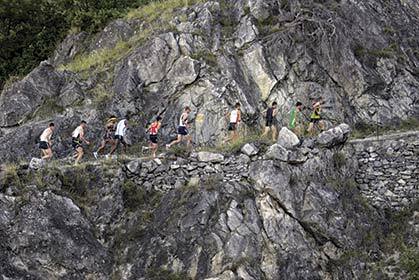 This summer will mark the 42nd running of Sierre-Zinal. Many of the world’s best runners will be in attendance, too. Joe Gray will be back. So will Stevie Kremer. Come August 9, however, the race director who oversaw the event for 41 years will hand over the reins. In his place will be race co-directors Tarcis Ançay and Vincent Theytaz. Both are longtime participants. 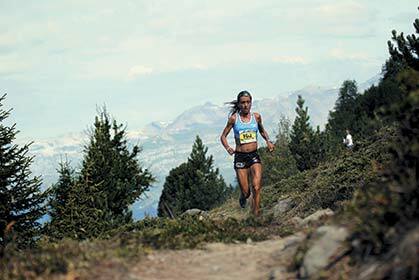 Ançay is a world-class trail runner and snowshoe racer. For many years, he worked as a postman, famously running with the mail between stops in the Anniviers valley below the race course. In 2006, he won the race he’ll now be overseeing. Ançay, for his part, fully understands just what he’s inheriting. As the day unfolds, the well-oiled machinery of Sierre-Zinal’s bénévoles will swing into action for another memorable day in the mountains. After the race, wine will flow under the big tent whose predecessor once welcomed mountain runners on a snowy day 43 years earlier for a race many thought impossible. 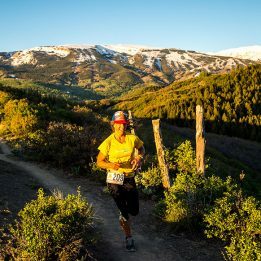 Doug Mayer is founder of Run the Alps, a trail-running tour company. Along with 3,999 other runners, he’ll be at the start of Sierre-Zinal this August 9th.